Often, the distinction between industrial gases (sometimes referred to as “balk gases” or “low purity gases”), and specific gases (sometimes referred to as cylindrical gases or high purity gases) is complicated. 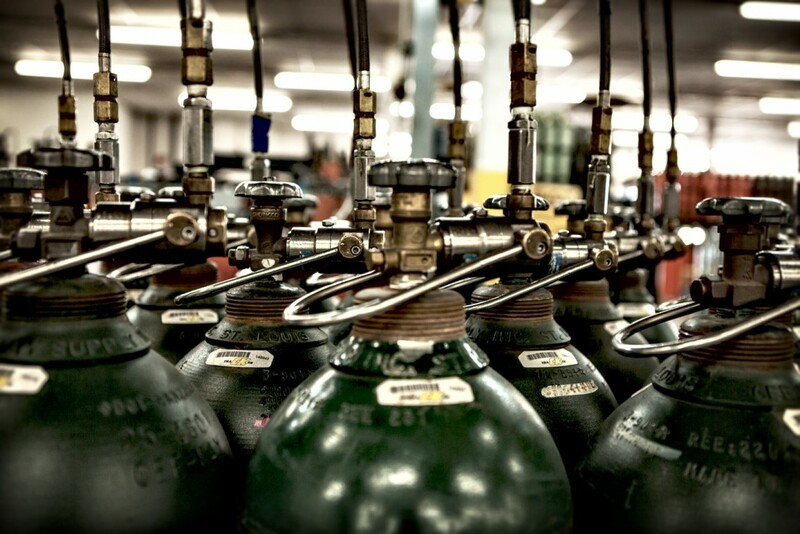 Compressed Gases Association sets standards for suppliers of all types of compressed gases. It’s mission is developing and upgrading safety standards and safe practices in the industrial gases. In the wider semantic pattern, most of the compressed gases used in some industrial projects and applications can be placed in the category of industrial gases. Therefore, we must consider factors beyond their practical aspects including complexity, purity level, and certainty about the combination of gases, to properly define the difference between industrial gases and specific gases. Compressed gases are often divided into five unrelated groups: atmospheres, fossil fuels, refrigerant gases, toxic gases, and gases that are unlike any other group. Belonging to these groups is somewhat contractual and they are usually categorized based on the source of the gases, application or chemical structure. Specific gases can be grouped into each of these five groups. In fact, these gases are high purity industrial gases. In the dictionary, one of the meanings of the word “ specific “ is expressed in this way, “unusual, distinctive, containing signs or having superior quality”. According to these meanings, specific gases can be defined as high quality gases for specific applications and the applications and projects are provided by usinglaboratory analysis and studies and other methods to determine, minimize or eliminate the unknown or undesirable components. According to the combination of specific gases, the precision of combination for obtaining the required concentration of the reactant componentsis vital. In the dictionary, one of the meanings of the word “specific” is expressed as, “unusual, distinctive, containing signs or having superior quality”. When pure gases are used as backup gases for laboratory equipment such as chromatography, mass spectrometry and other types of analyzers and detectors, they can be considered as specific gases. Manufacturers of this type of high-sensitivity equipmentusually determine the purity level of pure gases used in their equipment. For example, helium is used with high purity and free of moisture as the carrier gas in these devices. When some impurities are seen, the performance of the equipment will face with some problems, or it will hurt the equipmen. An appropriate general rule is that the purity level (sometimes up to 99.99999) or the amount of impurities should be taken into account, pure gases can be considered as specific pure gases. Specific pure gases are well used in the production of semiconductors and other similar controlled applications. They can also be used to evaluate and examin the pure bulk gases. Carbon dioxide is a good example of these types of gases. The drinkable quality CO2 used in the production of carbonated beverages can be considered as bulk gases. Because the gas is used in highvolume. However, due to the purity level of the gas, it is a matter of concern for human health, the specific pure gas of CO2, in which all the impurities are measured, is necessary to calibrate the tools used to measure the purity of CO2. Most of the specific gases are compound. When we discuss about the constituents ofspecific gases, the atmosphere is virtually limited. Combined specific gases are commonly used with a variety of analyzers to control the process and comply with the rules. Some of the combined specific gases are somewhat “standard” and may contain only three or four constituents, such as nitric oxide and a mixture of sulfur dioxide that are usedin companies providing water and gas services to calibrate continuous monitoring system for production and Greenhouse Gases emission (CEMs). Other gases may be quite complex and contain 30 or more components. Ususally, specific combined gases are prepared to use standard reference materials (SRM) to confirm the accuracy of the measurement of the components of the compound. This provides the ability to track the standard measurement. The measurement standard has been approved by the Metrology Institute, such as the National Institute of Standards and Technology (NIST). Specific combinations usually have components that are measured on a scale of one in million or one in a billion. Laboratory analysis has alwayse been consistent, serious, and critical to determine the quantity of all components and impurities in a particular gas. For each cylinder containing a combined specific gas, as well as pure specific gases, a formal document called the Health Certificate or Quality Management of the product is provided. The certificate specifies the following points: the concentration of all contents, the composition method, the type of laboratory analysis, and the reference standard indicating the gas mixture and the expiration date. The expiration date refers to the time when the components of a compound remain in their certified concentration within the tolerance range. Depending on the stability of the contents, the shelf life of the product varies from six months to two years or more. The process of preparing specific cylinders, such as Echolife nobel gas processes of the Scott’s team, can be used to condition the inner walls of the cylinder to increase the useful life of the gas mixture. Usually, specific gases are not used in high quantities as industrial gases, and they are available in steel or aluminum cylinders with a pressure above1362 kg /cm2. Consequently, they are sometimes referred to as cylindrical or capsule gases. The price of the cylinder is not added to the price of the specific gas and should be returned to the gas supplier after its content is finished. Usually, until the return of the cylinder, a low rent is paid monthly. Many specific gases are also available in small, portable and non-returnable cylinders such as Scott’s portable cylinders. Other specific containers, including bottles that are often used in laboratoies and floating piston cylinders, contain volatile liquid mixtures. Purchase of specific gases may be stress-induced. Because of today turbulent business condition, it’s probable that someone will only buy a gas product for its price. Definitely the price of the product is a concern, but be careful! Although in some cases organizations such as the Environmental Protection Agency may have determined the least accuracy of manufacturing process for a specific combined gas, there are few standards for the quality of specific gases. Combining procedures, quality control, and cylinder preparation are fluctuating between suppliers of specific gases. Besides, the suppliers do n’t always use the common naming method when introducing their products. Even if the name of the products is the same, there may be differences in the characteristics of the gases. The best advice is to carefully evaluate your exact requirements before buying it. Then talk about it with your specific gas supplier to make sure you understand how the features of a specific pure gas or a gas mixture canfulfill your requirements. Also, remember that most specific gases require the use of a specific delivery device that protects the purity and integrity of the gas constituents.